Every new Mommy knows she needs a basket full of diapers for her sweet baby dolls. 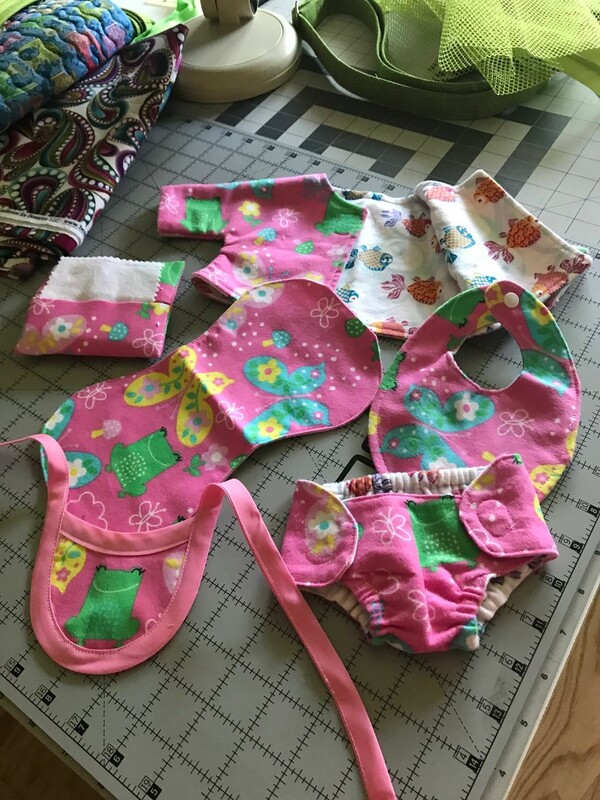 This simple and fast pattern will supply a whole diaper service worth of washable and re-usable diapers, enough to provide endless hours of fun. Its two-piece design makes it easy to mix and match fabrics; perfect for twin diapers as well. A curved front flap offers plenty of style and hook and loop tape closures make it easy for little hands to open and close all by themselves. Somehow magic happens when little hands learn to care for their dolls and playtime becomes about nurturing others. It’s those lovely life skills that imaginative play is all about. This PDF sewing pattern is design to fit 15" baby dolls such as Bitty Baby® and Bitty Twins®. Recommended Fabrics: Any fabric without too much stretch will work great. Cotton prints make a cute diaper full of color. Flannel prints and lightweight fleece also work well. For a thinner diaper that works under tight outfits, line with a simple cotton weave. For a more traditional feel, go with a plusher lining fabric like a flannel or lightweight fleece. I made the entire set and the instructions were great and easy to follow. The diapers turned out so cute. The pattern is easy to use and added the elastic for better fit. Will be making more of these. Thanks for the pattern! the pattern was easy to use. The finished diapers made a little girl very happy! The pattern is easy to use and makes an adorable diaper. The option to put elastic in the back waist ensures a snug fit every time. Have made a couple of different color diapers already to match sundresses. This is going to be a "go to" pattern for my baby doll outfits. Quick and easy. Kids love it.